Possibly Tasmania’s all-time favourite cricketing son, David Boon was a pugnacious right-handed batsman who served his state and country with enormous distinction. He was not always the most stylish player, but for what he lacked in fluency he more than compensated with his ardour for occupying the crease and accumulating runs when they were most needed. His one-day international record was also impressive. From 181 matches he amassed 5964 runs at 37.04, including five centuries. Boon was known across international cricket for his courage, both in facing the fastest bowlers when batting in the top order and for his willingness to field in the most dangerous position in the game – short leg. As an 18-year-old, Boon played a starring role in Tasmania’s history-making Gillette Cup win in 1978/79, the state’s first interstate one-day title, and he never looked back over the course of his 17-year career. He was appointed to the post of Tasmania captain at different ends of his career and was at the helm when his state enjoyed a fruitful first-class season in 1997/98. He finished as Tasmania’s leading run scorer in domestic limited overs competition (1725 runs) and second highest first-class run scorer (8029). 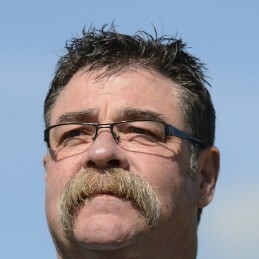 Boon came into the Australian side that was struggling terribly in the mid 1980s. It was said the team improved as Boon did. Predominantly in the no. 3 position, Boon’s durability was a vital ingredient in Australia’s resurgence as a cricketing power. He was dropped for a short period in 1986/87, but he re-made himself as a top order batsman who could adapt his game to one day cricket. His courage was often at the core of Australian performances and it was common to see his square cutting, driving and pulling upsetting the rhythm of even the finest of bowlers. He made his Test debut against the West Indies in Brisbane in 1984 and played his last Test for Australia against Sri Lanka in Adelaide, in the third Test in 1995/96. Boon served as vice captain to Allan Border and toured consistently during his time at the top for Australia, making three Ashes tours, two visits to the Caribbean, one Test tour to India, two Test tours to Pakistan, one visit to South Africa, and three visits to New Zealand. He also played in three World Cups, winning the Man of the Match award in Australia’s victory in 1987 against England in Calcutta. Boon was a member of the 1987 World Cup winning side, claiming Man of the Match honours in the final with his score of 75 as Australia beat England by seven runs. Among many highlights were his roles in four Ashes series wins, particularly the 1989 triumph and his honour in hitting the series-winning runs, and his flawless unbeaten 184 in the Bicentenary Test of 1988. Boon also led Durham in the English County Championship from 1997 to 1999, guiding the side to its best finish in the last of these three years. After retiring from all cricket following the completion of the 1999 county program, Boon accepted a position in marketing with the Tasmanian Cricket Association in Hobart and in 2000 replaced Geoff Marsh, his mate and former opening partner, as an Australia selector. David is now one of only 7 ICC Elite Officials. His legend also lives on at the ground in his home city of Launceston where the major stand has been named after him. He is a marvellous personality at any event you hold, and of course theres the 52 cans…..